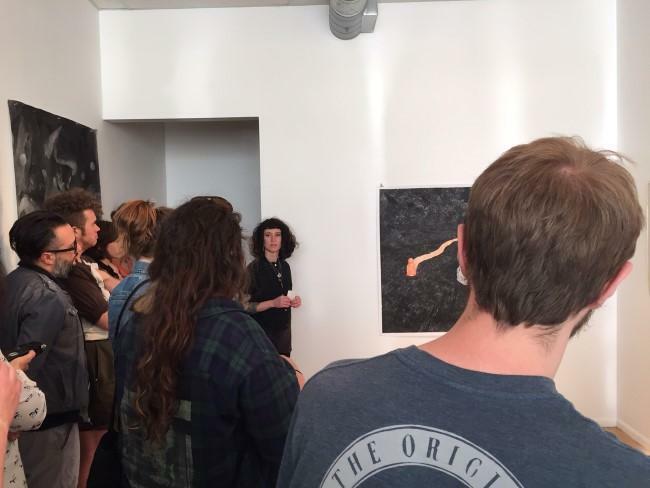 Danni Parelman (facing the camera) was one of three artists having work critiqued at Plug Projects in April. 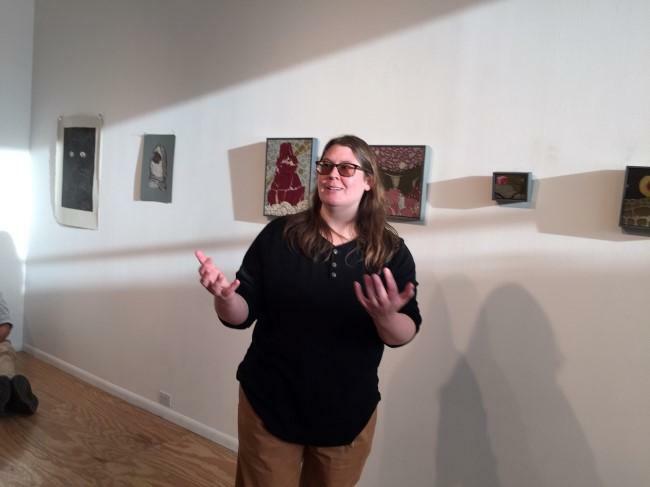 Amy Wright, another artist being critiqued in April, talks about her small paintings. Melanie Johnson, the third artist, makes large-scale drawings. 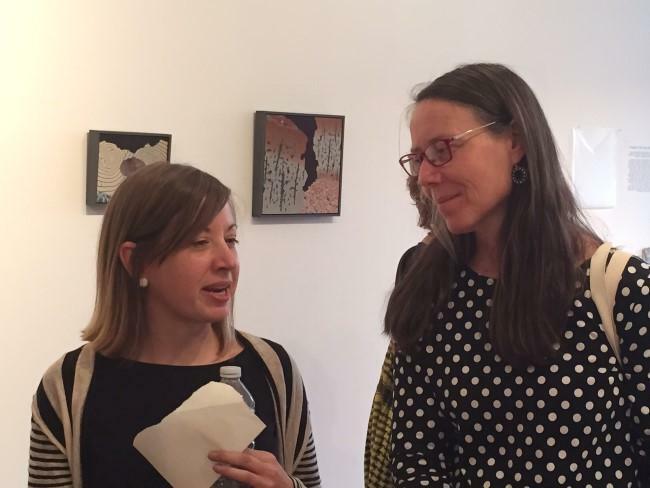 Artist Melanie Johnson (left) with one of the guest moderators, artist Adriane Herman. 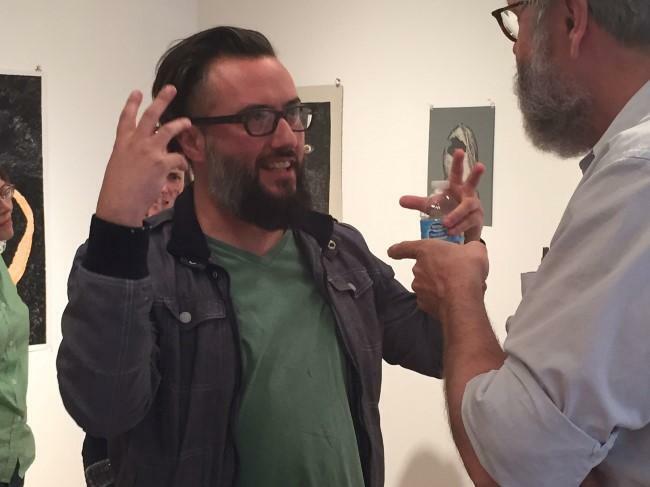 Ricky Allman, a professor of painting and drawing at UMKC, was one of two guest moderators for the April critique night. Listen to the story: Critique night at Plug Projects. Wright's paintings are filled with tiny details, meant to evoke imaginary worlds. They also involve food. One of the guest moderators was Ricky Allman, a professor of painting and drawing at the University of Missouri-Kansas City, who asked Wright about the role of light in her paintings. "Light’s sort of squishy and weird and out of our control," Allman said, "and everything in these are so precisely controlled, so I don’t know if you have room to spill some ink or get crazy with it?" "I would like to get a little more experimental," Wright said. "I had a lot of fun making these but I’m kind of tired." "They’re extremely labor-intensive!" Allman said. "You must be exhausted!" 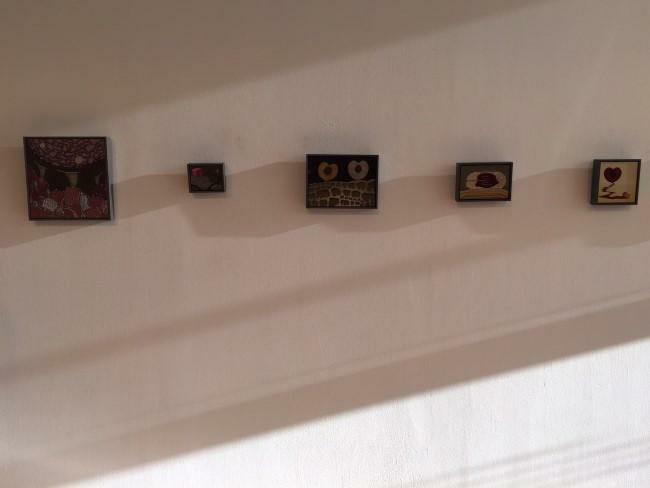 Small paintings by Amy Wright were the subject of lively conversation. This was one of the livelier exchanges at critique night, which also involved a lot of thoughtful silences – and a lot of rambling as artists explained what they’re trying to do, or worked through their creative struggles. Each artist was on the spot for 30 minutes. Longtime Kansas City artist Garry Noland was the moderator. "I’ve told all of the artists to pretend that we’re all a big room of curators," Noland told the people in the room, "and to put out for us what she feels is most critical about her work and what she wants us to know that are the underlying basics of her work." Plug Projects is a curatorial collaboration between five Kansas City artists. They've been hosting critique night for four years now, since the gallery opened in 2011; they also do film screenings and publications. They’re trying to bridge disciplines, says Caleb Taylor, one of Plug’s co-founders. "There’s a lot of people who make work in a vacuum," Taylor says. "It doesn’t mean they’re not making quality work, but we’re hoping to expose that to other people and offer that opportunity to have criticism so they can go back to their studio and make very productive choices." For the artists, Taylor says, these nights are much more generous than the harder-edged critiques they might have experienced in art school. An art lover who shows up and isn’t used to this kind of thing, he says, will learn a lot about complexities. "The complexities of people’s ideas, the complexities of their practices, the reasons they want to do things, the reasons they’re thinking about things in their work," he says. "It unveils the drama that occurs around a studio practice in a very complex manner." For example, during that critique of Amy Wright’s work, the other guest moderator, artist Adriane Herman, was frustrated by Wright’s tiny paintings. "I can’t really see them," Herman said. "I don't know if it’s my vision or that they’re so tiny. I want a magnifying glass. Can you respond to that? I can’t really see into them." "That’s a little disappointing to me," Wright said. Herman asked the audience: "Am I think only one here (who has trouble seeing the work)?" "She’s definitely pushing the limits of our perceptions," Allman jumped in. "Definitely, the tiniest tiny dots you really have to strain at." "I mean, hats off to you," Herman said. "You are painting beyond human capacity to perceive." "I don’t want them to be inaccessible," Wright said. "The point is not to frustrate." To an outsider this seemed tense, but afterwards, Wright said the experience was great. "It was very informative," she said. "When I work on these, I get so wrapped up in making them it’s really hard to imagine how other people view them for the first time. I will admit to being nervous, but it was a very positive experience. A very warm group." The observers say it was good, too. In the crowd were a couple of curators, some students from the Kansas City Art Institute — most everyone was an artist, so they weren't there to tear each other down. "I think it’s really important for artists to be able to speak about their work," said Laura Nugent, a painter, who has not had her work critiqued in this setting. "I want to be supportive of those who have the guts to come out and do it in public, to an unknown audience." For artists who feel brave, Plug Projects always has an open call. 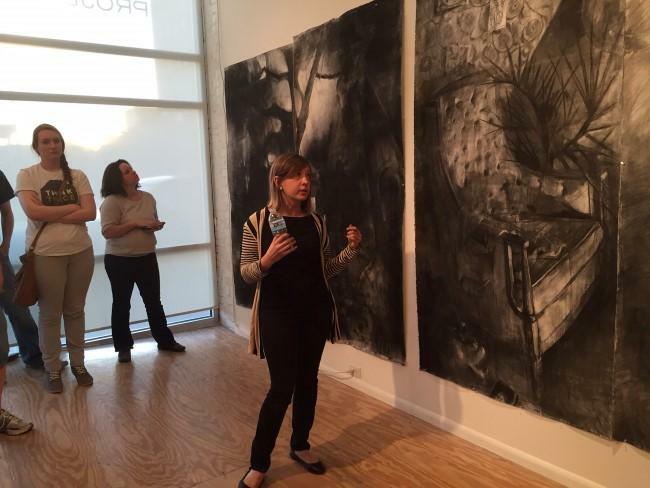 For art lovers who want to go deep, the next critique night is July 2.